A white male poet once told me I would be "more beautiful" if I had long hair. This happened when I started studying at Sarah Lawrence College for my MFA; I went to a party to meet some of the other writers. While I couldn't care if he thought I was beautiful, I couldn't help but wonder why people still think this way, especially people who are apparently educated enough to be aware of gender stereotyping. In other instances, people have assumed I must be a lesbian just because I have short hair, which is giving a uniform to different groups of people. As a queer woman, I was never offended by this assumption, but offended because there isn't one way queer people look. And these types of assumptions are dangerous, because they create divides at best, and at worst, influence people who commit violent crimes against the queer community. Remember when Jennifer Lawrence debuted her short hair, and suddenly the media world was in a frenzy? Hollywood is like a fire-breathing dragon--no matter where you turn, you'll get burned. Countless magazines and blogs had headlines such as "Important News: Jennifer Lawrence Has Cut Her Hair Short," to "Hunger Games Fans Upset After Actress Shows Off Short Hair," which is both hilarious and upsetting. No one's hair should be that important (or interesting) nor should anyone be personally upset by another's fashion choice. There seems to be too much micro-inspection when it comes to how a woman chooses to wear her hair, especially when in the spotlight. Of course, this is not news. What I find most troubling, however, is there always seems to be backlash when a woman, famous or not, decides to chop off her hair. While plenty of critics and fans alike supported Lawrence's chopped cut, there were many disparaging comments made that are innately sexist, such as: "Should have cut her dessert as well." When googling articles for "short hair," I often found men, and even women, writing articles about why women shouldn't cut their hair, or the ridiculous reasons why they do, such as "wanting attention" or to "play a girl wanting to be a guy in a movie." Of course, in media, it is often perpetuated that a woman cuts her hair only because she is distressed. Even in my own life, there have been several times I cut my hair, and people often asked me if I just went through a break up. Like...a woman can't have ownership over her own hair? This is, of course, does not to mention any of the racial components about hair--and how the media routinely white-washes hair constantly. In the past, I have routinely kept my hair short. Part of this is because I hated taking care of, and styling, my hair. The other reason is because I was afraid I wouldn't be perceived as a feminist if I had long hair--that suddenly, I "sold" out. Of course, I don't think having short hair makes a woman more independent, intelligent, or subversive than a woman who doesn't--but it's also hard not to buy into the pressure--or react against it. However, the freely given criticism I often received is still mind-blowing to me. A few years ago, I made an appointment to have my hair trimmed; the woman cutting my hair kept saying it was "too short" and that I needed to grow it long. I still remember it to this day--not because I was offended, but just because this was still a thing in the mid-2000s. Keep in mind, my hair wasn't even that short right now, it was in a bob. When I was in high school, I had cut my hair a la Joan Jett, and many girls looked at me in disgust, asked me "why" I had done it, as though I had killed someone. When men and women assume a woman cuts her hair because she must be upset, or going through a break-up, it sends a terrible message: A woman's value lies only in her beauty (or perceived lack of), and that only emotional instability would cause a physical change. Thus, women with short hair must be mentally "unstable," and worse, if a woman is single, it must be because no one wants to be with her. Not because, you know, she wants to be single. Or just is. Of course, long hair has been historically viewed as a sign of luxury, in that it implies two things: You can afford the maintenance and you are healthy. In the past, the idea of long hair was not only just an ideal feminine standard, but extends back to the process of natural selection, as thick and healthy hair is a sign of youth and fertility. Simply, to have long hair means you are young. Our culture is obsessed with youth. While it could still be that men may intrinsically prefer long hair for evolutionary and biological reasons of sexual selection, the backlash is also due to what is considered masculine and feminine. 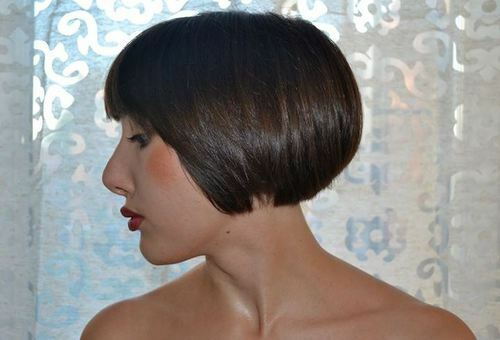 Short hair is still seen as a masculine trait--as if traits as masculine or feminine to begin with. Unfortunately, women who choose to have short hair are seen as threatening, because they are rejecting the feminine standard of beauty, and in some ways, rejecting male and female power dynamics. In general, change makes people nervous, even if the change is good. Men and women are also afraid of ceasing to be seen as attractive to others, thus less valuable, since our culture defines a person by their outward appearance. In the same way young women are meant to have long hair, older women are supposed to cut theirs off. Again, it stems from evolution, in that women past a certain age could not bear children, thus were not deemed as objects of fertility, and thus, sexuality. Obviously, this is absurd--but people still believe it--even if subconsciously. I used to think I always had short hair because I don't like being told what to do. Having always been accustomed to examining my emotions and the reasons why I act the way I do, why I desire the things I want, I always questioned the "feminine" ideal. Now, I have long hair, and I don't feel guilty. It's hair. It's a part of my body. It's OK for me to own it, to own my sexuality, to feel attractive regardless of what "statement" I'm making. I'm a feminist no matter what. This may sound silly to say, but many of us fall under these arbitrary rules and pressures. I never wanted to be afraid of what others thought, of what I thought of myself. But first, I have to stop worrying about how neatly I fall into boxes, even if those boxes are labeled as "feminist" or "queer" or whatever it is I want to be.